Anyone who watched Austrian skydiver Felix Baumgartner's amazing 24-mile descent from the stratosphere to a perfect upright parachute landing in the New Mexico desert knows they were witnessing history in the making. During his four-minute 19-second freefall, Baumgartner reached speeds of 833 miles per hour—Mach 1.24—breaking the sound barrier, the first time a human has done so without being strapped into a vehicle of some kind. Those old enough to remember might reminisce about Chuck Yeager, the famous test pilot who first broke the sound barrier in an experimental Bell X-1 jet in 1947. Those a bit younger may remember seeing Yeager's feats chronicled in the 1983 movie "The Right Stuff" (based on Tom Wolfe's book), about the Mercury 7 astronauts in the early days of manned space flight. Interestingly, Baumgartner's jump, which was delayed twice, was evenutally performed on October 14th, 65 years to the day after Yeager broke the sound barrier over the Mojave Desert. In a nod to a new era of technology, whereas Yeager's accomplishment was witnessed by only a few, Baumgartner's feat was viewed in real time by millions via YouTube and other live streaming services. While there are claims that the sound barrier was first broken during World War II in the Messerschmitt Me 262, such claims are considered unofficial. After Yaeger's plane, which he named "Glamorous Glennis" after his wife, was dropped from the bay of a B-29 bomber, Yaeger achieved Mach 1.06—700 miles per hour—at 43,000 feet. 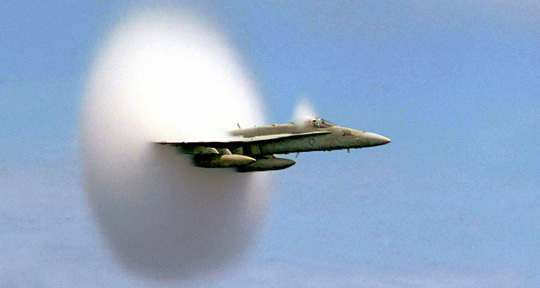 The speed of sound is named for Ernst Mach (1838 — 1916), an Austrian physicist who studied supersonic motion, primarily in the form of ballistic shock waves. He realized that when a bullet or shell moved faster than the speed of sound, the air in front of it was compressed, causing crater-type wounds as well as a second distinct "boom" that was separate from the explosion. Mach was able to photograph the shock waves using schlieren photography (invented by German physicist August Toepler in 1864), which captured the shadows of the waves. Mach later invented high speed photographic techniques to better capture the phenomenon. The Mach number is the ratio of the speed of an object to the speed of sound, and is a relative number depending on atmospheric conditions. As altitude increases, the velocity needed to achieve the speed of sound decreases. For example, at 30,000 feet, the mach speed will be just under 1000 feet per second, but at sea level, it is closer to 1100 feet per second. As the perils of supersonic flight became manageable, it was assumed that it would be the next logical step for passenger air travel. The Concorde seemed to be the answer. It traveled at twice the speed of sound, cutting in half the time it took to fly from New York to London to about three and a half hours. However, with high operating costs and low passenger numbers, it didn't quite meet expectations. When an Air France Concorde crashed in 2000 killing all 100 passengers and 9 crew members on board, that seemed to seal its fate. Plans for supersonic passenger air travel are still in the works, however. NASA is working on finding a way to overcome the sound of the sonic boom that prevents supersonic flights over land, and Boeing, Lockheed Martin and Aerion are all working on supersonic technology. In fact, Aerion predicts it may have a supersonic aircraft in service by 2020. As experimental military aircraft continue to break speed records, it begs the question: just how fast can man travel? Officially, the world speed record for a manned aircraft is Mach 6.72—4,535 miles an hour. This record was set on October 3, 1967 by William J. "Pete" Knight in an X-15-2A, an experimental rocket-powered aircraft, over Edwards Air Force Base. However, Lockheed Martin's SR-71 Blackbird has a potential speed of over Mach 7, and it is believed that military aircraft may have secretly (and unofficially) exceeded the speed record.